Chancellor Gordon Brown appears on course to meet his projected borrowing requirements for the year. After 11 months of the fiscal year, Britain's public sector net borrowing (PSNB) reached £30.9bn, compared to £17.2bn in the same period last year. 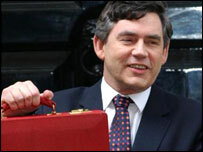 In his Budget speech on Wednesday, Mr Brown projected that Britain's PSNB this would reach £37.5bn in 2003/04. The chancellor is confident that the government will meet his golden rule of balancing the budget over the cycle. Public sector net borrowing (PSNB) in February was £1.06bn, compared with £500m the same month a year ago, the Office for National Statistics (ONS) reported. That was broadly in line with expectations, with most economists predicting PSNB of £1bn. Delayed self-assessment tax receipts helped the government run a sizeable surplus in the month, the ONS said. That led to an increase in tax receipts in February to £13.9bn, compared to £12.4bn in the same month one year ago. But spending is also higher than one year ago. Public sector net debt outstanding at the end of February totalled £361.1bn, equivalent to 31.7% of Britain's GDP - well below the government's 'sustainable investment rule' of 40%. The news about higher tax receipts will cheer the chancellor, who predicted on Wednesday in the Budget that he will meet his fiscal rules going forward into the next election. Under the "golden rule", government spending (excluding investment) and tax receipts must balance over the economic cycle as a whole. So Mr Brown is able to balance his £37bn Budget gap this year against accumulated Budget surpluses in the early years of the Labour government. The current economic cycle is expected to end by 2005/6, and there is much concern among experts about whether the chancellor will have as much room for manoeuvre in future years. He predicted that borrowing would decline next year to £33bn, and continue to fall in future years. But that will depend on economic growth producing more tax receipts to fill the government coffers - something that is still looking less than certain. This year, despite good news on the economic front, the deficit worsened by £10bn compared to projections one year ago, mainly because of weaker tax receipts. In particular, the government is counting on a 17% increase in corporation tax to help bridge the Budget gap. And government spending is set to slow, despite Mr Brown's high-profile announcement about extra money for education. In future, increases in spending will increasingly have to balanced by savings in the public sector elsewhere.